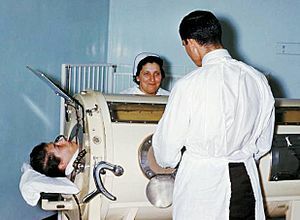 Examining a patient in a tank respirator. A disease can be caused by many things. Sometimes germs enter our body through food, water or air. A person can be infected by infectious agents like bacteria, viruses or fungus. Disease can also be caused by eating bad or old foods. There are small germs in old foods that can cause diseases. Sometimes the germs produce chemicals or toxins which causes the disease. One of the most common causes of disease is poor sanitation and lack of clean water. Some deadly diseases like malaria in tropical parts of the world are spread by a mosquito. Animals that spread disease are called vectors. There are many vectors, including snails, ticks, and fleas. Some people are born with 'genetic diseases.' These are diseases because of an error or mutation in a person's DNA. An example of a mutation is cancer. Living or working in an unhealthy environment can also be a cause for diseases. Diseases are more common in older people. Some diseases can be helped with medicine. Infections can often be cured by antibiotics, though resistance to antibiotics is a problem. Some disease may be helped by surgery. Not every disease can be helped with medicine or surgery, though. Some diseases must be treated during the whole life; they are chronic (long-lasting) diseases. An example of a chronic disease is diabetes mellitus. Diabetes can be treated (made better) but it can not yet be cured (made to totally go away). People who usually treat diseases are called doctors or physicians. Some diseases that are common or very bad are tested for even in people who are healthy. If these diseases are found early they can be treated before they cause problems. An example would be checking a woman for cervical cancer with a test called a pap smear. If cervical cancer is found early it can be cured. If it is found later it usually causes death. Another example is immunization. The basic of it is to make the body ready for a disease. The body has its own defense against disease called the immune system. One special characteristic of the immune system is its ability to remember. If a person had been sick before and had recovered, the immune system produce a substance called antibodies which fight the disease if it comes back to the person. The antibody is specific to a particular disease or antigen. An example of this is measles which is a virus. A person usually a child who had never been sick with measles is given a milder form of the virus, this cause the immune system to produce antibodies against the virus. If this person is exposed to the same virus in the future, the person's immune system will remember and will fight the virus. The disease must be found and stopped in early stage. The disease should be common or be easy to recognize. The test for the disease should be easy, work all the time, and not hurt people. The society is well-trained and can recognize most common symptoms on some diseases. The treatment for the disease should be safe and be easy for people to get. Epidemiology is the study of the cause of disease. Some diseases are more popular for people with common characteristics, like similar origins, sociological background, food or nationality. Without good epidemiological research some diseases can be hard to track and to name. Some diseases can be taken for something else. This is why Epidemiology takes a huge part in understanding how to protect ourselves against viruses, toxins and bacteria. Disease Facts for Kids. Kiddle Encyclopedia.